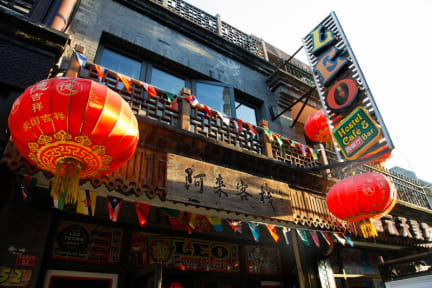 Had a great stay at Leo Hostel! The food is good and cheap and so is the alcohol! It's located in a very nice area, surrounded by shops, bars and restaurants! The only little negative point was that the toilet was on the other side of the building, so you needed to go down stairs and thru the bar to get there. But other than that its was amazing!!! Good hostel. The rooms where fine and the location was perfect for us. It’s close to almost everything. Also the staff was very helpfully. Location is touristic, walking or taking an Ofo/Mobike bike to the nearby metro is about 1 km. Dorms are huge, equipped with airco's and privacy curtains. I liked the separation of toilets/showers from the dorms. Im an average 1.82, but could nearly fit in the bed and couldn't fit under the shower. I was staying at the 1st floor and had to walk the walk of shame each time I had to go to the toilet. The staff acts nice, but I found they're really just faking. Atmosphere and people are awesome. Friendly reception and nice food. Airport pickup was really reliable too. Only downside were the chinese cleaning ladies that were screaming and banging on doors from 7am onwards. There were no lockers in my room and there was almost no space to leave luggage on the floor. Other than that, pleasant stay. Good comfy beds in a very nice street. The showers weren't working well.